Sci-Fi modelers know Polar Lights for their re-issues of (back-engineered) old Aurora kits. What many don't know is that the company also has a strong line of race cars, including classic NASCAR© racers. 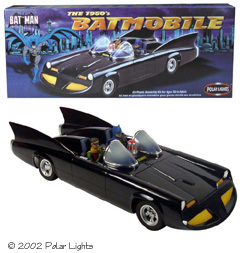 Subjects like the recent Ecto 1 and Back to the Future Delorean allow them to combine their areas of expertise - as does their latest release: the DC Comics' 1960s Batmobile. Like many of their kits, the Batmobile comes in a box that's too small for it - I'm never able to get all the parts back in and the lid closed after I open one! 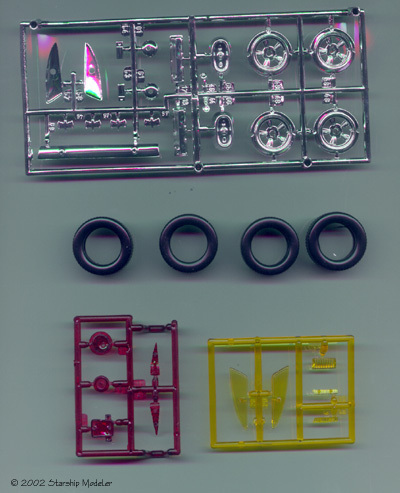 The kit consists of 75+ injection molded styrene parts, nicely molded in black, clear red, clear amber and clear. Four vinyl wheels and a sprue of chromed parts round out the bits. The sprues are packed in six separate baggies - a nice touch that lessens scratches and keeps parts from coming adrift before you get the box home. Rounding out the kit are a large sheet of bi-lingual instructions (French on one side, English on the other) and a small sheet of waterslide decals. This model is fully the equal of mainstream car kits. Unlike some of their other sci-fi vehicles, you get a full (but basic) engine, a separate hood you can pose open, detailed interior including the inner door sides, and "crew" figures (Batman and Boy Wonder, seated). They seem a bit small for the scale and their poses aren't that exciting, but separate heads and arms will make it much easier to scratch-build more dynamic forms. 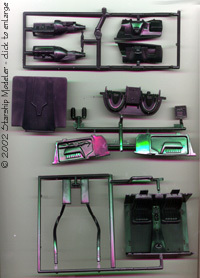 Chromed parts are provided for the wheel hubs and "Bat Logo" hubcaps. 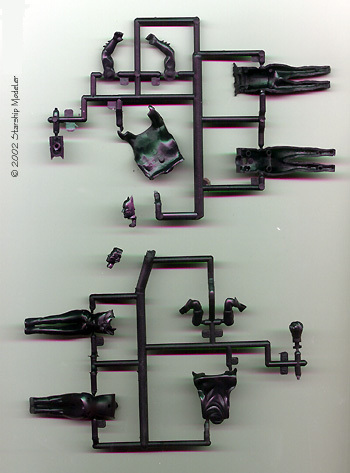 They attach to the sprues in small and unobtrusive places that will enable the builder to get them free without damaging the finish visible on the completed model. Detail throughout is decent - enough to satisfy most folk, but with plenty of room for those wanting to super-detail. Engraved lines, like the ones that set off the doors, are sharp and reasonably deep. Raised detail isn't as sharp as, say, a FineMolds kit, but is quite acceptable nonetheless. Molding quality is quite good, with no flash or sinkholes on my sample, and manageable ejector pin marks. The clear and tinted parts are actually clear and distortion free. Instructions are typical for Polar Lights - which means they're generally adequate. 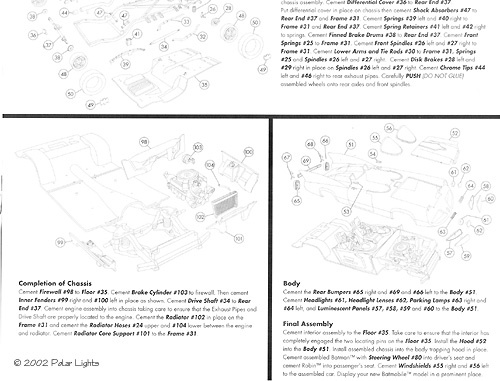 There are several exploded diagrams with accompanying text (including color call outs) - they look clear enough, but my experience with previous Polar Lights kits indicates that there will some frustrating omissions. Oh, well. The overall paint scheme is simple, and you can always pop the hood on your car to see where bits go, so I don't expect this to be much of a problem. Lastly, you get a small sheet of decals - markings for the instruments on the dash and for the Bat Logo on the hood. Is it accurate? How do you measure such a thing? Compared to the few panels I've seen, the proportions look good and all the major bits are there. Close enough to perfect for me. I've taped many of the major assemblies together, and fit appears pretty darn good. 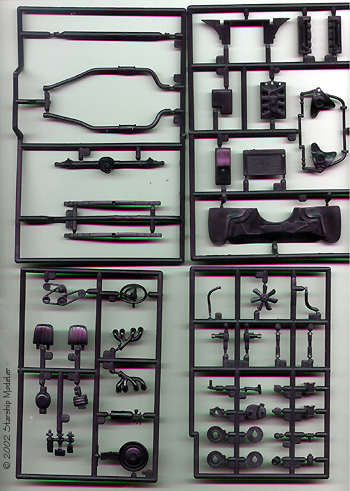 Don't be put off by the number of parts - this kit should go together fairly quickly, especially if you build sub-assemblies and paint as you go. One note about the finish - if you use black, you won't be able to see the hood decal. The instructions call for a dark blue, but I'd think a dark purple pearl might look better. This kit looks great in the box. There's enough included to provide a nice challenge to less-experienced builders, with room for the super-detailers to go nuts. Fit and molding quality is leaps ahead of their older kits, so there won't be the trauma associated with Black Beauty (say) to have a fine looking replica on your shelves. Many thanks to Polar Lights for providing the review sample. Manufacturers and retailers, interested in getting your wares reviewed and publicized on a site averaging 3000+ readers a day? Contact us! This page copyright © 2002 Starship Modeler. Last updated on 19 December 2002.